Sometimes, you need to communicate without talking. Baseball coaches have perfected techniques for telling all the relevant players what to do in various situations. 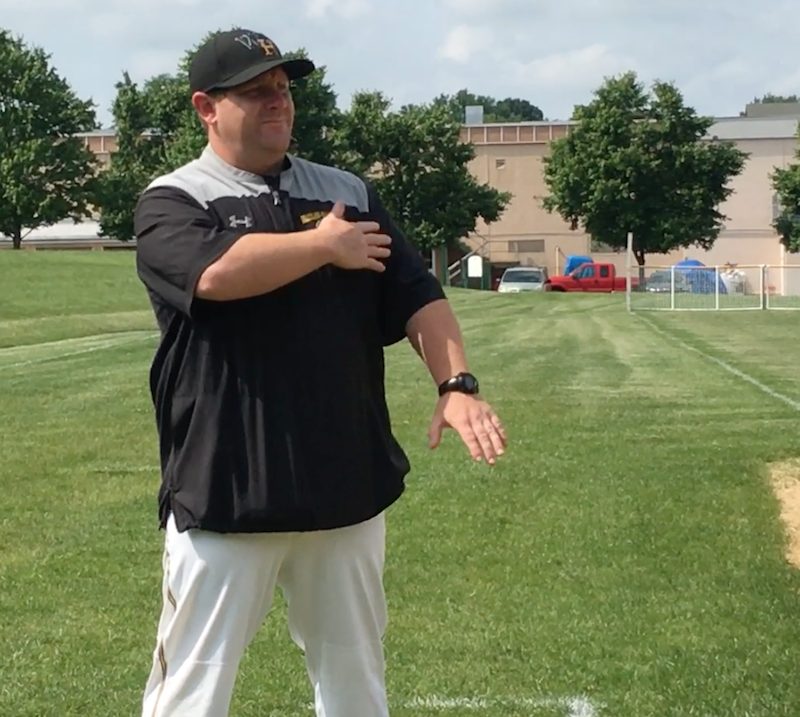 Andy Mulvey, the Rams’ Head Varsity Baseball coach since 2010, is willing to show how he communicates with the batter from the 3rd-base coaching box, 90 feet away. b. One way of communicating precisely and discretely is by using an “indicator”. In this case, the indicator is the coach touching his left arm, which tells the batter and the runner that the next sign is the one to pay attention to. The coach successively touches nose/right elbow/nose (which mean nothing) but when he touches his left arm, the players focus on the next sign (wiping his hand across his chest) which signals a hit-and-run. He then gives a series of other meaningless signs, and ends by clapping his hands, which confirms the hit-and-run call and signals the batter to step into the box and prepare for the pitch. As in all these examples, the coach stands at a 45-degree angle, to ensure that not only the batter, but also the base-runners, can see his signals. c. Another way of giving signals is to pre-determine that the second sign will always be the “live” or relevant one. In this case, the coach touches his nose first, then his chest second, indicating again the hit-and-run, followed by other meaningless signs and clapping, which ends the sequence. d. One way to trick the opponent, who may be trying to steal our signs, is to give one sign, then “wipe it off” by sliding the hands down the thighs. The next sign after wiping his hands on his pants (in this case he touches his nose, which indicates a steal by the base-runner) followed by other meaningless signs and a clap to end the process. e. It is also important for the batter to confirm that he has received and understood the sign. In this case, playing the batter, Coach Mulvey sees the sign, and shows that he got the sign by tugging on the brim of his cap. f. Sometimes, the batter may be unsure of the signs he just saw. If so, he can signal, with a rotary move of his hand in this example, that he needs the coach to repeat the sequence of signals. Once he sees and understands the sign, he confirms that he received it by tugging on the brim of his cap.